Photographing the wedding rings are an important aspect of any wedding event. As wedding photographers, we understand the importance and significance of the wedding ring details and do all we can to be creative and artful with these photographs. It's really fun for wedding photographers to create art with the wedding rings for so many reasons. The shape is an important element of the photo to consider. Other available details are often available such as shoes, flowers, food items, etc to add to wedding ring photo art. Wedding rings are such a personal choice, and they come in all kind of shapes and sizes. This particular bride an groom held their wedding at Progressive Field, home of the Cleveland Indians. 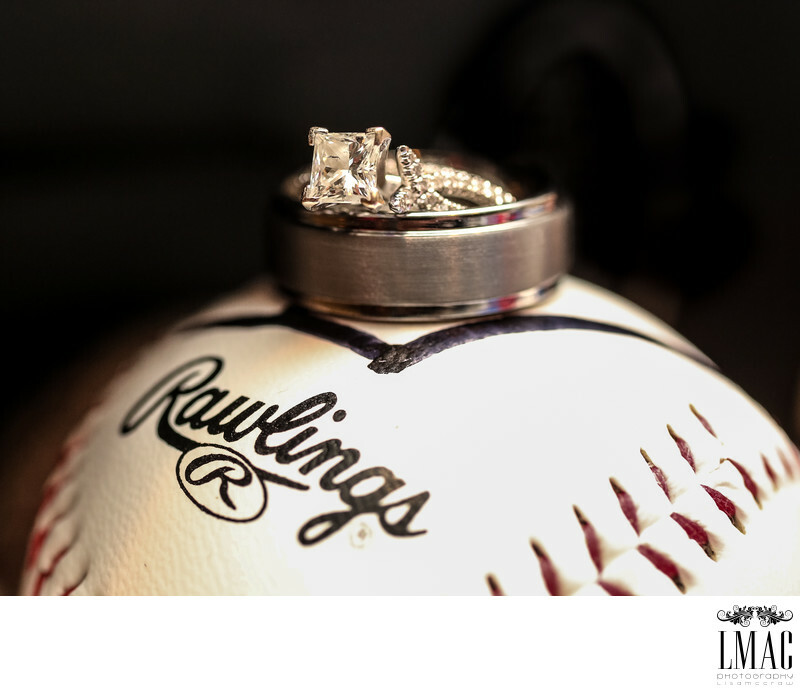 Baseball is super important to this couple and we love to photographed themed weddings including the wedding details. LMAC Photography is very experienced at creating beautiful ring art for any wedding photography folio. Location: 2401 Ontario St, Cleveland, OH 44115.